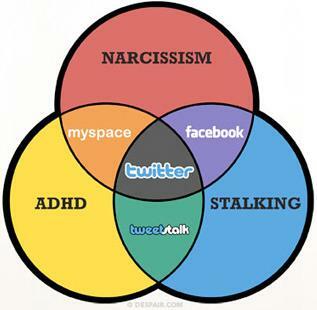 "A gorgeous, 8-color masterpiece which captures ever so brilliantly the three behavioral disorders propelling the continued phenomenal growth of today’s most widely-trafficked social media sites. And at the intersection of the dysfunctional forces of Narcissism, ADHD, and Stalking resides today’s fastest growing social media experiment of all- Twitter..."
Phil, you forgot LinkedIn. Perhaps you ran out of colors and empty "venns"!! First - I really enjoy your blog! Meaningful insights and fun reading in a balanced mix. Thanks and keep it up. Your comment re linkedin - Yes I also see some benefits, and I'd like to hear your thoughts what the good parts are.